YOLO is making its mark in London, so can YOU! Just get down to the Bardgehouse at OXO Tower. 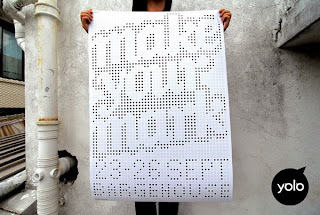 1 Dot it, mark it, draw, doodle or jot on it. All entries will receive a limited edition YOLO tee (while stocks last) and will also be showcased on our website. Alternatively, if you love to scribble your thoughts online, log on to http://pencil.yolo.sg and make your mark. 50 major design shows in 13 Cities, in 10 Countries with over 2000 Exhibitors from 33 Nations. 'Designersblock is the original and best' Icon Magazine.